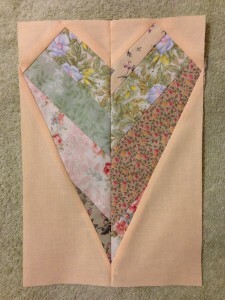 I am traveling and suddenly realized that I haven’t uploaded the picture of my February block I had made before I left. So, here it is. I found this block somehow difficult to make. But that is the challenge to learn and that is great. I love Block Lotto. It’s the Mother/Daughter project for Helen and me. We are both learning a lot. For me it is not so much that I might win. In fact, when I had made my January block Helen and I kidded. I said that I had way too many projects and should donate my block. Helen said that if I do win, I always could donate the winnings to her. So I told her that I was donating my chance to her (just between her and me). So, in fact, since it was Helen’s chance to win, she won. And I am so happy for her because she will make a beautiful quilt with the blocks. One happy family! I’ve been following your updates from your trip on your blog–looks like a very interesting trip.